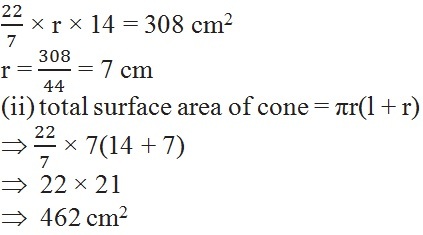 Assume that π = , unless stated otherwise. (ii) cost of the canvas required to make the tent, if the cost of 1 m2 canvas is 70. 5. 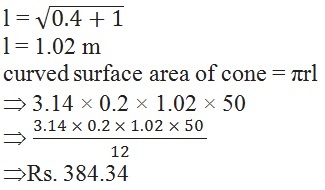 What length of tarpaulin 3 m wide will be required to make conical tent of height 8 m and base radius 6 m? Assume that the extra length of material that will be required for stitching margins and wastage in cutting is approximately 20 cm (Use π = 3.14). 6. The slant height and base diameter of a conical tomb are 25 m and 14 m respectively. Find the cost of white-washing its curved surface at the rate of 210 per 100 m2.